10 Best Oil Misters - Review and Comparison in April 2019! Cooking and Baking are two styles of art which require oil in decent quantities and at different times in the cooking and baking processes. Like a good cook or baker would know, the dish turns out just right with the perfect quantity of oil, not too much nor too little. No more spills and sticky messes to clean up with spilled oils. Remember that time, when you picked up the spray can of oil and happily sprayed it, just to see it run out at the time when you had invited guests for dinner? Using an oil mister is also far more economical than directly drizzling oil into a dish from a bottle. Save on costs too by getting this oil mister which is pretty economical as compared to the spray cans available in the market. Since the oil mister converts the oil into tiny droplets of spray, less quantity of oil is used. Similarly, it is a healthier cooking option too, as less oil translates into lesser calories. So, technically it is a win-win situation without any compromise on taste of the food. In my search for the best oil mister, I carefully analyzed a number of products available in the market. Let’s see which product came out on top in our carefully curated list of oil misters. 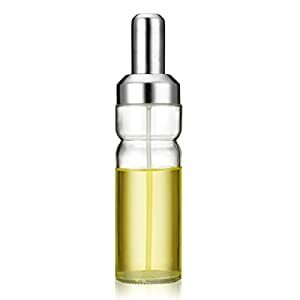 Just fill up the container with your chosen oil type and generate a little bit of pressure by pressing on the lid, point the nozzle mouth to where you want the oil to be and press lightly. Since the oil mister has a built-in oil pressure controller, it ensures that no mess or spills happen and just the right amount of oil droplets are sprayed as needed. The pressurizing formula also controls the amount of oil sprayed, which may look like more but actually its not, as its just pressurized. Durability – Smartly designed with BPA plastic used with a glass base, this is a real beauty with a user-friendly and ergonomic design. Ideal for use with a variety of oils like olive oil, sesame oil, vegetable oil and more. 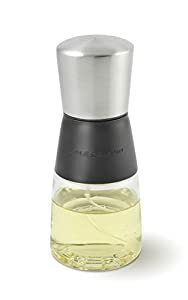 Clean and Care– This Prepara oil mister comes with an easy-clean trigger handle and the glass bottle, which are easy to clean and prevents oil build up and clogging. How to Use– Uniquely designed with a trigger handle which controls the spray of the oil based on how fast or slow the spray is pulled. A slow trigger pull gets a stream of oil to come out while if you pull it faster, a more smooth and fine mist is generated. 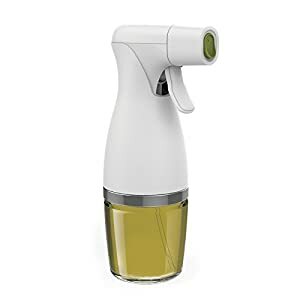 Durability– This oil and vinegar sprayer from Hall & Perry is BPA-free with an non-aerosol pump. Free of chemical propellants, this sprayer is also reusable which makes it more durable and affordable too. Clean and Care– Cleaning this glass bottle spritzer is convenient with its simple and ergonomic pump design which also prevents clogging. This oil and vinegar dispenser in one is quite a multi-tasker and can be easily washed and then refilled with another liquid of your choice. 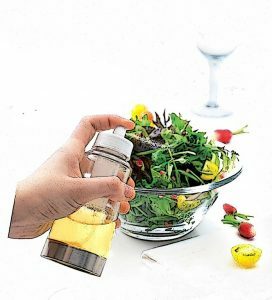 How to Use– Just fill up the bottle with your favorite oil, press the pump and spray on your favorite foods or dishes! The spritzer allows you to control the amount of the oil droplets you want in the foods too by pressing the pump lightly or with more pressure. 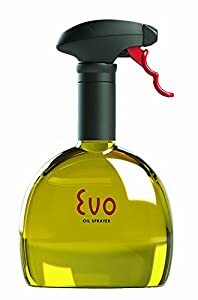 Durability – This environmentally friendly oil sprayer from Evo has been beautifully designed by the renowned Michael Graves Design group and is BPA-free, Latex-free and DEHP-free. Clean and Care-Economical and reusable, this oil mister spray bottle is also dishwasher safe. The unique fan pattern and twist on funnel of the non-aerosol sprayer can be easily kept clean to prevent any clogging too due to its clean design. How to Use– Less oil is used to cover a larger surface with its amazing fan pattern which consistently dispenses 1.35mm each time you pull at the trigger. Less oil used also translates to a healthier lifestyle with less fats being used, which is great for people looking at portion control too. 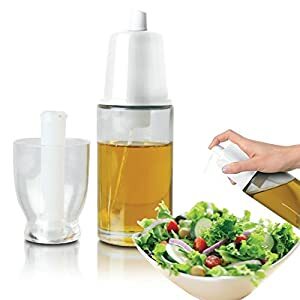 Durability– Durability is showcased in the glass bottle design of this oil mister from HoooWooo, which sprays oil droplets uniformly on whichever dish you are using it on. Reliable and consistent sprays make it great to use for oil, vinegar, and lemon juice too. Clean and Care– The non-drip spray mechanism and big open stainless-steel mouth makes the oil mister really easy to clean and maintain. This Hooowooo glass bottle has even passed the FDA test for quality standards. How to Use-Uniform oil sprays and droplets are generated if you apply a consistent pressure on the spray pump. The glass bottle allows you to see the capacity and refill it before its oil content is all used up. 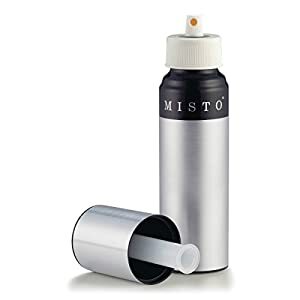 Durability – This Misto manufactured model is a non-aerosol oil mister which is free of chemical propellants and BPA-free. Made with an aluminium finished body, it is reusable and an environmentally friendly model which has also been the best oil mister 2015 brand in the US. Clean and Care– Economical and easy to clean, this Misto has a convenient pump-style cap with can be removed to be cleaned and put back on. How to Use – Great for using with any type of oils, vinegars, lemon juice or even wines. Its pump-style cap has a two-step operation where you pump the container first, followed by pressing on the valve to release the desired quantity of oil droplets. Durability– This oil and vinegar mister is a great option for cooking and using in the BBQ too. Made with glass, this bottle has to be hand washed with lukewarm water and one or two drops of detergent and is not dishwasher-safe. 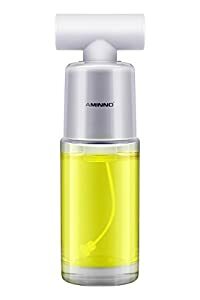 The Clean and Care-Wide open mouth of this Aminno manufactured vinegar mister makes cleaning the bottle and the sprayer a breeze. This product also comes with a money-back guarantee in case you are not completely satisfied with the product. How to Use– The wide bottle mouth makes pouring the liquid also easy and with an easy T-handle cap, you can be rest assured that air pressure is contained and it does not clog. Use it with your favorite oils, vinegars and citric juices and even wines for meal preparation or just tossing on a salad. 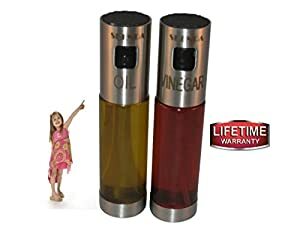 Durability– Go ahead and use this Skenda oil and vinegar cruet combination which is great at spraying for oil and vinegar. Clearly marked and labelled bottles make it super easy to refill and use whenever you need them for your use or when entertaining guests. Made with BPA free material with a metal bottom and glass body. Clean and Care– Simple design allows for easy cleaning of the bottles and the slim, minimalist design allows for convenience when using the sprayers. How to Use– Just hold the bottle and press the spray on the top to release to release the desired quantity of oil or vinegar spray. It also comes with a lifetime or money-back guarantee. Durability– Manufactured by Cole & Mason, this oil and vinegar mister features a premium looking design with a stainless-steel top and a plastic base, all made with BPA-free materials. It can also be used as a balsamic vinegar spray bottle or for any type of cooking oils too. Clean and Care– The oil catching mechanism used in this mister saves oil and doesn’t allow for any waste or clogging to happen. It works by catching the residue from the nozzle base and putting that oil back into the bottle for reuse. This has been labelled safe for hand wash only with lukewarm water and drops of liquid detergent and not safe for dishwasher use. How to Use– Before using for the first time, just pump the lid for about seven times and then press the nozzle for the desired quantity of oil. It comes with a lifetime guarantee from the manufacturer. Durability– Using an FDA approved mechanism, this ideal mister removes any smelly chemical propellants from the food and reduces wastage. This model can be used for any type of oils, vinegars, citric juices and conveniently colored bottle tops helps to do that. Clean and Care– Ergonomically designed with a safe and secure grip, this bottle is not made from glass, so no fear of breakage. Lightweight and with a clean design, it allows for easy cleaning too and doesn’t allow clogging. How to Use– Consistent and personalized sprays lets you use the mister exactly as you want to. Convenient to use and durable for reuse, this sprayer will not splatter or leak or even break. Easy to refill and reuse, it will probably last years if maintained properly. Durability– Designed for use with most types of oils, vinegars, juices and even wines, this sprayer is extremely versatile. 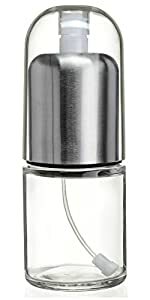 Forumlated with scratch resistant glass, this anti-bacterial glass bottle comes with an elegant design finished with a stainless-steel top. 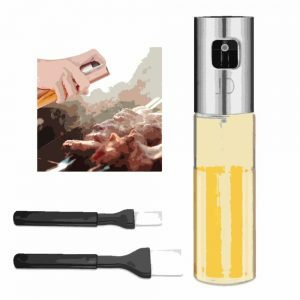 Clean and Care– Great to use in cooking, baking and food preparation, this premium oil mister from ChefAdvantage is a healthy alternative to aerosol spray cans. This model comes with a special anti-clog filter technology which prevents clogging. How to Use-With a non-aerosol formulation, this premium mister needs pumping up before use to prevent clogging and ensure a smooth, consistent mist. Q: Why use an oil mister? A: Directly using oils from their plastic bottles or even small packages can end up creating a mess around the kitchen. Who has the time and energy to keep cleaning it daily, right? With an oil mister, you spray the oil exactly where you want, without any spills and leakage. Q: How should I ideally use an oil mister? A: Using an oil mister is really pretty easy. Just fill up the mister bottle with the desired oil brand and leave a bit of space empty on the top. Prime the bottle and pump for use by pressing a few times and enjoy the oil spray consistently wherever you need it. Use it for wines, balsamic vinegars, and any other liquids which you ideally use in the cooking or baking process. Q: Where exactly can an oil mister be used? A: Wherever you use oil, an oil mister can be used. Cooking, baking, food preparation, salads, tossing over pasta or simply drizzling onto a piece of bread, an oil mister can be used anywhere and in a personalized manner too, with as little or as more sprays as needed. Q: How should I clean my oil mister? A: Majority of the oil misters in the market can be cleaned either by hand wash with lukewarm water and a few drops of detergent. Some misters are dishwasher safe too. 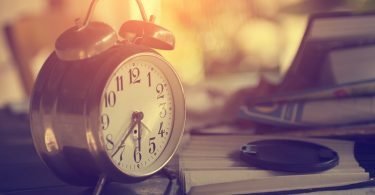 Just look for the manufacturer’s labels once and you should be good to go. Q: How do I regulate the oil quantity? A: Simply pump on the nozzle of the bottle of mister, as often you want. Applying less pressure on the nozzle pump would give out a soft mist and a hard press would generate a mist of oil droplets. Save your food from becoming an oily mess and give your health a break too by using one of these practical and useful oil mister products. Whether you want to simply dress your salad or grease your pan for a cake, grill your chicken for the barbeque or lightly air fry your vegetables, an oil mister is the perfect addition to your kitchen and a great and much appreciated gift for your loved ones and friends too! An oil mister is the perfect addition to your kitchen which helps you to do just that. Use the right amount of oil and elevate your dishes from good to great. Choose your favorite oil and the perfect oil mister and you are good to get started!